Photolarvicidal effect of curcuminoids from Curcuma longa Linn. against Aedes aegypti larvae. SOUZA, Larissa Marila de; INADA, Natalia Mayumi; VENTURINI, Francine Perri; CARMONA-VARGAS, Christian C.; PRATAVIEIRA, Sebastião; OLIVEIRA, Kleber Thiago de; KURACHI, Cristina; BAGNATO, Vanderlei Salvador. Abstract: In this study we evaluated the photolarvicidal activity of different curcuminoids forms: Natural Turmeric (NT), Synthetic Curcumin (SC) and Synthetic curcumin formulated with sucrose (SCS) against Aedes aegypti larvae which is the major vector of dengue, chikungunya and Zika viruses. Two strategies for curcuminoids delivery were chosen for the experiments: (i) larvae exposed to aqueous solutions of curcuminoids in the concentration range of 5-25 mg/L (w/v) and (ii) larvae exposed to two different types of curcuminoids carriers (pet food). Phototoxic effects of the curcuminoids were evaluated by counting the dead larvae after sunlight exposure, at irradiance range of 30-60 mW/cm2. The characteristic photobleaching time for each curcuminoids in solution was also determined in order to infer the safety of these molecules in the natural environment. 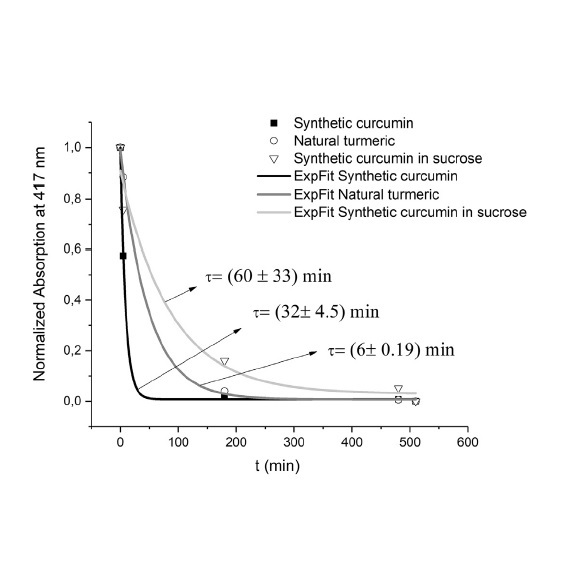 Curcuminoids solutions showed high photolarvicidal activity after 30 min of sunlight irradiation, with LC50 values of 20.0, 11.6 and 2.2 mg/L for NT, SC and SCS, respectively. The curcuminoids carriers, despite showing high mortality (about 90%), presented photodynamic activity only after 8 h of sunlight irradiation. The curcuminoids remained in the aqueous solution for up to 3 h; subsequently, the maximum absorption peak of these pigments was completely modified. The characteristic photobleaching time for each sample was 6, 32 and 60 min for NT, SC and SCS. These original and relevant results show that the combination of curcuminoids pigments with sunlight establishes an extremely effective alternative for Ae. aegypti larvae control, ensuring high environmental safety due to the low persistence of these molecules in the presence of light.